The Golden DNA Activation Sessions activate the DNA templates of the Absolute Harmonic Realms. Our time matrix has 15 dimensions and are broken down into 5 Harmonic Universes called HU. We live in HU1, because we are within dimensions 1, 2 and 3. HU1 holds our physical body. HU2 holds dimensions 4, 5 and 6 and our Soul Identity. HU3 holds dimensions 7, 8 and 9 and our Over Soul Identity. HU4 holds dimensions 10, 11 and 12 and our Christos Avatar Self which is also called our Christ Consciousness. HU5 holds dimensions 13, 14 and 15 and our Rishi Identity. Golden DNA Activation is the activation intended to assist in embodying a person’s Higher Self, to attain self-mastery, in finding person’s OWN life purpose, in remembrance of “WHO YOU ARE” and in assisting the ascension process. When you receive a Golden DNA Activation Session, these fragmented parts are healed and reassembled, creating a true state of connection with Source. This is the true evolutionary path of human consciousness. The Golden DNA Activations are distant healing sessions which consist of activating DNA from its current blueprint, back to the original sacred God Gold print. This is done by using specific Golden DNA Activation codes that enable this to occur and have imbued within them the templates of Source/God, which are untouched by any interferences, distortions, or mis-deeds of people. In these sessions the intent is to activate the 144,000 Golden DNA Strands from the Universe of Absolute Harmonic Realms (the higher universal self of our universe) With the Golden DNA Activation Sessions people can start embodying the frequencies of the Absolute Harmonic Realms here on Earth. These golden strands are found within the 12 Strand Diamond Sun DNA Template. When you embody your Higher Self, you experience ascension. Earth and humans are in the midst of what is called a Stellar Activation Cycle, which occurs every 26,556 years. These are important periods of time because it is during these times that the process of biological ascension is accelerated. Ascension can only happen when DNA is activated. There are already 144,000 beings that have chosen in their soul contracts to activate the Golden DNA and when this happens we will create a bridge for our entire multidimensional universe to merge with the Absolute Harmonic Realms thus assisting in Earth’s ascension to the Golden Liquid Realms. Golden DNA Activation Sessions are required for ascension and is like an upgrade in your operating system from Source. You will be receiving constant daily downloads of the most efficient and self-actualizing divine operating system. DNA Activation upgrades your life from chaos, drama, anxiety, inherited imprints, shadow self, debt, suffering, overwhelm, stress, poor relationships to the original sacred God Gold print. You are able to embody your Higher Self, attain self mastery, find your life purpose, remember who you are, instantly re-invent yourself, and attract a higher grid of people, places, times, and events. You will attract your true soul family. I am grateful to facilitate the Golden DNA Activation for committed individuals who are ready and who desire to be the frequency holders for the ascension of Earth and humanity. These activations consist of three sessions where one activation per week takes place. 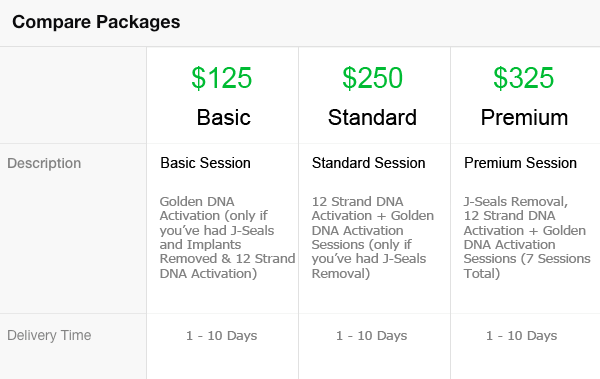 Before choosing the Golden DNA Activation Sessions, it is highly recommended to have the J-Seals and Unnatural Implant Removal and the 12 Strand DNA Activation Sessions. The purpose of these sessions is to prepare your body vibrationally for the accretion of the intense energies that you will be receiving. It is also important to know that without removing the energetic blockages such as the various seals and implants within your body, DNA activation is impossible. 12 Strand DNA Activation is essential because it begins the process of DNA activation and the accretion of light frequencies that are necessary and required to upgrade your energy body. This allows you to receive the proper energy downloads and upgrade enhancements that your body currently needs at this time for your own ascension. Basic is the Golden DNA Activation Sessions. These 3 sessions activate the 144,000 golden strands within your activated 12 Strand Diamond Sun DNA Template. Standard is the 12 Strand DNA Activation and Golden DNA Activation Sessions. This these sessions are for those that have already received a J-Seals and Unnatural Implants Removal Session. Premium is the J-Seals and Unnatural Implants Removal Session, 12 Strand DNA Activation and Golden DNA Activation Sessions. This is the full package to allow you to remove all energetic blockages, activate your 12 Strand Diamond Sun DNA Template, and activate the 144,000 golden strands within your 12 Strand Diamond Sun DNA Template. The Golden DNA Activation Sessions are 45 minute sessions where you must lay down with your eyes closed, wearing loose fitting clothing, nothing in pockets, around neck or on your fingers. Each session must be performed a minimum of 7 days apart to allow for proper integration of these energies and there will be additional aftercare that you must do daily in order to continue to integrate the energies. Jaye is very gifted healer. He has provided me many clearing and healing sessions over the last 6 months. But, Golden DNA Activation session was intense and transformative. I’ve felt so much Joy and peace after the session. I would recommend it. Thank you Jaye for an incredible experience that has been life changing for me. I Am so Grateful! To Everyone deciding if The Golden DNA Sessions are worth it…OMG, its Amazing that this is my 2nd purchase. The experience i felt during each session was intense. Its not uncomfortable however very noticeable. The Energy current feels like a pulsating sensation moving throughout your entire body. Having done the Golden DNA twice now, my life has become more peaceful and everything positive is now flowing beautifully into my life. Its Amazing how I Vibrate so much higher now and am meeting the right kind of people too. When it started it was almost instant. I got hot and the tingling started gently and then my hands were hot and tingled quite intense to the fingertips. I had visions of Angels in a beautiful Violet fire. Then I saw a tunnel and I was flying down it and it was Bright golden light. I felt I was flying and The Angels were looking after me, Awesome!